A portion of the still-stalled Base Village in July 2014. SNOWMASS VILLAGE – Aspen Skiing Co.’s managing partner, Jim Crown, signed an agreement with Related Colorado late Monday afternoon to buy a portion of Base Village in order to develop a Limelight hotel for Snowmass Village. The detailed plan for the 102-room hotel, 18 condominiums and three employee housing units located near the Elk Camp Gondola would be submitted Oct. 15, in concert with Related Colorado’s land use application for the base area project by that date. A private Snowmass Mountain Club, Four Mountain Sports shop, and in a separate application, the Fanny Hill Cabins, also are planned by SkiCo. Yet, after three hours of lively discussion by the Snowmass Village Town Council on Monday that started with the project’s vesting rights but segued into talk about an overly aggressive review schedule, staff and planning commission recommendations that are vague and favor the developer and community distrust of Related Colorado, SkiCo may find itself in the same situation that prompted it to pull the Limelight Snowmass plans last March: Lack of certainty about the project’s future. “Without having some of those vested rights continue, we probably won’t be there,” said Don Schuster, vice president of hospitality development for SkiCo. “Nobody wants to see Base Village completed more than we do. Certainty was in short supply by the majority of the council, even among those who seem to support extending the developer’s vesting rights beyond its Nov. 3, 2014, expiration date. The biggest impact to expired vesting rights is the employee housing mitigation rate. Related Colorado president Dwayne Romero said this could potentially add “eight figures” to the cost of finishing Base Village because more employees would need to be housed under today’s mitigation than when the project was originally approved in 2004. Councilman Fred Kucker also criticized aspects of the agreement and how they seemed to favor the developer, including a “force majeure” clause that could lead to a shutdown for reasons ranging from bad weather to labor issues. And Kucker was critical of a year-long extension that would be granted if review of the entire application takes too much time. 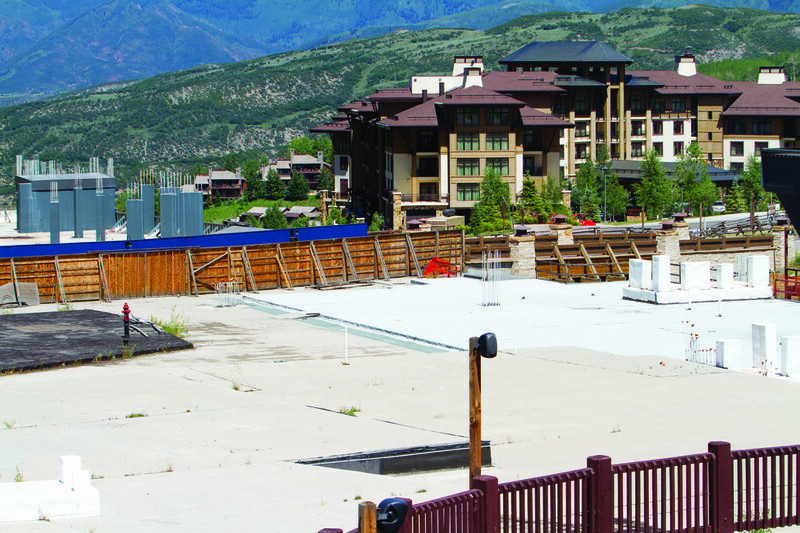 Snowmass Village resident Richard Goodwin suggested, “You would be better off to let this [this application] die a natural death.” He questioned whether Related is entitled to development rights in the first place because it didn’t meet its initial phasing completion deadline and other early milestones. Goodwin also criticized both Related Colorado and SkiCo for not doing right by the project in the first place. Councilman Jason Haber said it was “backwards” to extend vesting without a better idea of the end project and wrong to “release the one card we hold” over Related. Haber preferred that the vesting rights be extended “through a review period,” which could run at least six months. Similar sentiments were shared, via email, by 10 full- and part-time residents. In some form or another they cast a wary eye on extending development rights without seeing full disclosure of the future project. Romero said he is opposed to a protracted review and suggested it could lead to another stoppage by Related Colorado. The meeting to decide if vesting will continue beyond this November, as well as the public hearing, is scheduled for Sept. 8. Editor’s Note: Aspen Journalism and the Aspen Daily News are collaborating on coverage of local government. The Daily News published this story on Tuesday, Aug. 19, 2014.